And although we don’t get ice or snow every year here in the Dallas area, when we do, it tends to be bad. In fact, we’re actually more likely to suffer around here because of the frequency of such storms. In states where snow and ice can be expected each year, buildings are expected to be well-insulated to prevent problems like ice dams. People in these states are simply prepared for the yearly cold weather — Cities always have snowplows and salt trucks on standby to clear streets, airports are ready to de-ice planes and get them back in the air, and businesses are prepared to clear their roofs of snow and ice and deal with extreme winter weather. In the DFW metroplex, ice and snow is infrequent, which means that most people don’t plan for it, business folks included. However, it’s frequent enough that commercial buildings around here should be prepared to handle the added weight of snow or ice and the possibility of ice dams. With winter finally showing its face, we felt like now was a good time to discuss one little-known problem that most DFW business owners and operators don’t consider. An ice dam is a line of ice that you find at the edge of your roof. It “dams up” the remaining snow, ice, and water on your roof, preventing melting ice and snow from draining off. They’re usually caused by poor insulation on your roof. When parts of your roof release too much heat, portions of the ice and snow on your roof melt. Then, as the water flows down to less-heated portions of your roof (the edges) that water refreezes, forming a dam. And we don’t call it a dam because it’s keeping snow or ice on your roof — it actually forms small pockets of water on your roof behind a literal dam of ice. This is because the ice dam is keeping a portion of that snow and ice above the warmer portions of your roof, rather than letting it hit the colder edges and where it might refreeze (or simply flow off). 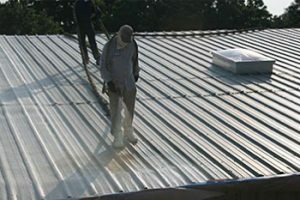 This water can damage your roof, leak into your building, and generally cause havoc. A leaking roof puts your products and infrastructure at risk, endangers data centers and other sensitive equipment, and creates the possibility for a slip-and-fall accident. The problem of ice dams is more complex than described above and relies on a variety of factors, but this is the gist of it. Ice dams are very preventable — a well-insulated roof keeps ice dams from forming by creating a uniform temperature across your entire roof. One of the best ice dam solutions out there isn’t a solution at all — it’s prevention. Removing an ice dam can damage your roof and usually needs to be done by a professional, so you really want to avoid them in the first place. In the meantime, the water held back by the dam has time to damage your roof and leak into your building. That’s where an SPF roof comes in. 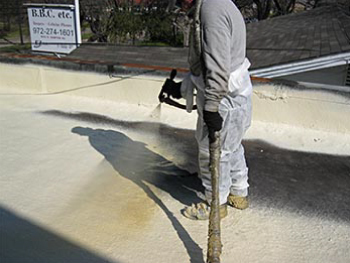 Spray polyurethane foam is one of the most insulative materials out there, and it’s likely the most insulative roofing material that exists. Not only will it help prevent ice dams, but it saves on HVAC costs year round. They can protect against hail, and unlike snow and ice, hail is something we see every year. Though we don’t often get snow and ice here in DFW, hail is a regular occurrence. This is why most of our customers come to us in the first place. 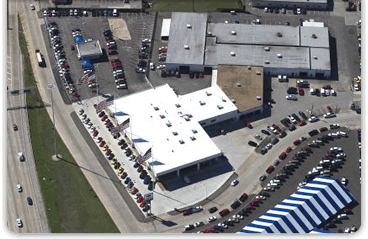 Some SPF roofing systems can protect against hail up to 1.75 inches. 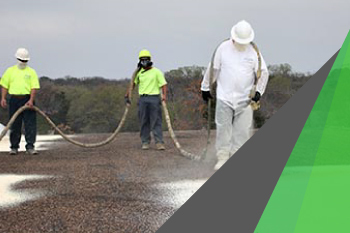 If you have a leaking, damaged, or aging roof that needs to be replaced, contact us to get a free estimate.